The global veterinary drugs market is largely consolidated with top ten companies holding more than 70% market, says a new report by Transparency Market Research (TMR). In 2015, the market was led by Merck Animal Health, Merial Animal Health, Bayer Animal Health, Zoetis Inc., and Elanco Animal Health reflecting a highly consolidated competitive landscape. Despite this, fierce rivalry exists among top players in the global market for veterinary drugs. In a bid to enhance brand image, several players are engaging in direct assistance as opposed to mass marketing strategies. Besides this, companies are offering attractive discounts on multi-product purchases. TMR forecasts the global veterinary drugs market to display a CAGR of 5.1% from 2016 to 2024. At this pace, the valuation of the market is projected to reach US$26.7 bn by 2024 increasing from US$17.2 bn in 2015. In terms of animal type, the market is divided into livestock animal and companion animal. Between the two, livestock animal held the leading share in 2015 due to an ever-increasing demand for poultry meat and high quality protein. The segment of companion animal is expected to display robust growth as well over the forecast period. This is due to increasing pet ownership and increasing expenditure on their well-being. By product, the segments of the market are anti-infective, anti-inflammatory parasiticides, and others. In 2015, anti-infective held the leading share gaining from the increased demand for zoonotic diseases. Nevertheless, over the forecast period from 2016 to 2024, parasiticides is expected to display higher growth than other segments. The segment is expected to display a CAGR of 6.1% between 2016 and 2024 thereby emerging as the most attractive product segment. 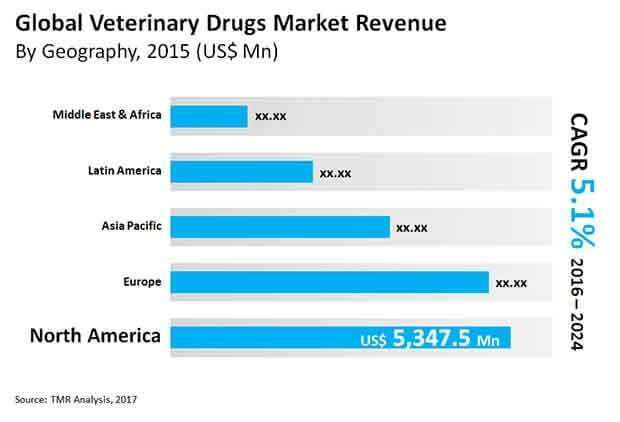 By geography, the veterinary drugs market is segmented into the regions of North America, Europe, Latin America, Asia Pacific, and the Middle East and Africa. In 2015, North America stood as the leading regional market accounting for 31% of the global market. The region is expected to stay at the fore until the end of the forecast period in 2024. The high number of pet ownership is the major factor boosting the growth of this regional market. Over the report’s forecast period, Asia Pacific and Latin America are expected to contribute substantial revenues to the overall market. In these regions, the increasing incidence of infectious diseases are fuelling the demand for veterinary drugs. The growth of the veterinary drugs market is driven by increasing pet ownership and a high spending on their health and well-being. In addition, innovations and advancements for surgical procedures for companion animals is also boosting the growth of this market. Due to increased consideration for the health and well-being of companion animals, their life expectancy has increased. Veterinarians and pet owners are looking to provide better nutrition to companion animals which may be in the form of nutritional supplements and animal wellness drugs. Besides this, the introduction of novel therapeutics that help companion animal combat zoonotic diseases is aiding the growth of veterinary drugs market. With the increasing incidence of zoonotic and vector-borne diseases the market is expected to be benefitted over the forecast period. The market is also expected to be benefitted from increasing demand for high quality meat that requires livestock to be free of diseases.